In a dangerous world, Deep Salt strikes terror into the heart of everyone. Hari lives in Blood Burrow, deep in the ruined city of Belong, where he survives by courage and savagery. He is scarred from fighting, he is dangerous and cruel, but he has a secret gift: he can speak with animals. When his father, Tarl, is taken as a slave and sent to the mine known as Deep Salt, from where no worker ever returns, Hari vows to save him. Pearl is from the ruling families, known as Company, which has conquered and enslaved Hari’s people. Her destiny involves marriage that will unite her family with that of the powerful and ambitious Ottmar. It soon becomes clear that the survival of their people depends entirely upon the success of Pearl and Hari’s mission. Why did I read this book: When I was at BEA this year, the quiet, unassuming Orca booth caught my eye – and when I saw Salt (and its sequel, Gool) sitting so prettily on the display table, I knew I had to have it. A post-apocalyptic/dystopian YA novel with a speculative fiction bend? Of COURSE I wanted it! In a future world, rules are simple and finite. The Company reigns supreme. Commoners live squalid, wretched lives in the Burrows, fighting amongst each other and feral packs of rats and dogs for food. And, when the Whips come for choosing, those that go to the Deep Salt do not ever return. When Hari’s father Tarl is caught in a Whip raid and rebels against his enslavement, he is sentenced to serve in Deep Salt much to Hari’s horror. Sworn to save Tarl, Hari tracks him through the harsh wilderness that isolates the Burrows and will travel to Deep Salt, tempting death itself to save his father. Along the way his path collides with Company heiress Pearl and her maid Tealeaf – Pearl fleeing her engagement to the much older, cruel Ottmar (incidentally, the owner of the Deep Salt mine). Though the simpering, spoiled Pearl and the spiteful, violent Hari hate each other on sight and seem to have nothing in common, they are more similar than they could ever believe – because both share the almost unheard of human ability to communicate and control others with their minds. United in their quest to understand their shared ability, Pearl’s former “maid” and mentor Tealeaf takes the two young adults to her people, the Dwellers. The fate of their world and every living creature is at stake, and Pearl and Hari are the key to survival. New Zealand author Maurice Gee takes on a grim dystopian future with Salt; a socio-political and environmentally-conscious post-apocalyptic (and radiation-ravaged) landscape. And, in a subgenre churning out post-apocalyptic/dystopian novels at an ever increasing rate, you might be asking yourself, what if anything distinguishes Salt from the pack? (As a huge fan of the dystopian and apocalyptic, I find myself asking this question more and more, too) Well, gentle reader, I’m here to tell you: Salt is indeed a memorable, old-school SF dystopian adventure-type novel, by virtue of Mr. Gee’s sharp characterizations, gritty storytelling, and – this is completely subjective – the sense of reader nostalgia Salt provides. If you’re familiar with our reading preferences, you’ll probably know that I am a sucker for dystopias and end-of-the-world stories. And, if you too are a fan of these types of books, Salt will undoubtedly strike a familiar chord with you. Salt is definitely what I’d consider “old school” in the subgenre – there’s the danger of nuclear proliferation, the deadliness of radioactive decay, and the mutations that these isotopes can wreak on all living things. The immediate influence (with Hari and Pearl’s ability to communicate across species’ with their minds) is with another author from Oceana – that is, Isabel Carmody’s Obernewtyn series. (Of course, I love the Obernewtyn series, so this is a good thing.) Also, Salt is reminscent of Patrick Ness’s more recent Chaos Walking books – the knife of the father, the violent, hateful young boy, the rich and pampered (but competent and totally awesome) young girl. Heck, there’s even a sort of Lord of the Rings sensibility with the irresistible power of Deep Salt as a weapon – those who possess the power are almost possessed themselves, refusing to give it up. These similarities, however, are not pointed out to imply that Salt is derivative in any way – rather, it’s a familiar (dare I say, classic?) premise and it’s testament to Mr. Gee’s writing skill that he manages to own this familiarity and create something entirely new and memorable from it. Also, on the note of familiarity, from a world-building perspective there is a twist to the landscape – it’s unclear if this book is set in a future New Zealand or perhaps on some alien planet altogether. I’m pulling for alien world (given the existence of the indigenous strange slitted-eyed and triple thumb jointed Dwellers, like Tealeaf – but that’s just speculation). From a plotting perspective, Salt is a fast paced adventure-quest sort of book, following two protagonists as they journey across unforgiving terrain and hone their powers, as they also discover the truth of Deep Salt. The idea of Deep Salt, the all-too familiar weaponization of this deadly element, well, it is terrifying stuff. There’s also a slight supernatural element too – the “voices” that the Dwellers and certain characters hear, the telepathic powers. These are all tantalizing plot seeds with a whole lotta promise in future books. But the most remarkable thing about Salt lies with its dual protagonists. I *LOVED* these characters – albeit for slightly twisted reasons. Neither Hari nor Pearl are exactly likable characters. They are not “destined” to save the world, and they certainly are not big-hearted or innately courageous, selfless characters beneath a thin veneer of purported “badness” (like so many other protagonists, especially in this subgenre seem to be). Hari is seriously messed up and tries to kill Pearl many, many times . Similarly, Pearl is spoiled, vain and condescending – but what’s cool about this is that both characters truly are products of their upbringings. On the grimy streets of the Blood Burrow, Hari has had to fight for everything he has; in the gilded Company palaces, Pearl has had a life of luxury, and although she’s had Tealeaf’s guidance and training, she still is a self-entitled princess. Both of these characters grow used to each other as a matter of necessity, not choice, and it is all very believable. This forced growth works because they aren’t two characters that automatically understand each other and want the same selfless goals – rather, they are selfish, flawed people that discover they need to work together because so much is at stake. And, in comparison to older characters much more set in their ways, the younger protagonists’ growth is ever more impressive and poignant. There’s so much in this book – the aforementioned character growth, the horrific journey into Deep Salt itself (seriously monstrous Rats of Unusual Size! ), the wars for power. Salt is gritty and it’s grim, and it doesn’t pull any of its punches. It doesn’t attempt to make pretty or condense its characters or its message – while the Company is the oppressor of the moment, it is clear that anyone in power, lowborn or Company born alike are equally ruthless and spiteful – and I admire that. The way this book ends, the tantalizing seeds planted in this novel (especially concerning the slightly supernatural aspect) have me eager for more. You better believe I’ll be back for Gool very, very soon. The Whips, as silent as hunting cats, surrounded Blood Burrow in the hour before sun-up and began their sweep as the morning dogs began to howl. Rain fell heavily that day, washing the streets and overfl owing the gutters. The gray tunics of the Whips turned black in the downpour, their helmets shone like beetle wings, and the sparks that jumped from their fingers as they herded their recruits fizzed and spat like sewer gas. They took ninety men, some from their hovels, some from the ruins, and prodded them, howling, to the raised southern edge of People’s Square, where the paving stones had not yet slipped into the bog. Brown water lapped the buildings on the northern side. Cowl the Liberator, crying Liberty or Death, raised his marble head above the rushes. Mosquitoes bred underneath his tongue. The Whips, as custom required, paused in their herding and mouthed “Cowl the Murderer” before going on. A cart with a covered platform and canvas aprons at the sides and back waited on the stones. A clerk sat at a desk under the awning, with a sheaf of forms under his palm and a quill pen, curved like a blade, in his other hand. His uniform was paler than the Whips’ (and dry) and had the Company symbol, an open hand, blazoned on the tunic. He frowned at the rabble herded in front of him and drew his head back in a vain attempt to avoid the stench of rotting shirts and festering bodies. The Whips raised their electric hands and shot fizzing bolts into the air, and the howling stopped. Outside the ring of guards, the wives and children of the ninety fell silent. Some kept their mouths wide in cries they dared not utter, while others wept soundlessly, their tears mingling with the rain, which fell more heavily, making puddles around their unclad feet. The clerk was untroubled. His speech was part of procedure, and the shouts and cries, and the howling and tears, were something he expected on recruiting days. He sat down and yawned behind his hand. A Whip prodded a man into the space before the cart, and then, with his gloves turned off, stripped off his clothing with raking sweeps of his iron hands. The man, young but stooped and thin, stood shivering in the rain. “No need for the hose today,” said the clerk, but he yawned again while his underlings sprayed the man’s body with disinfected water from a tank behind his wagon. The clerk took his quill and wrote on a form. “Deformities?” he said to a third underling who had stepped down from the cart. The clerk ran his eyes over the man’s body. “You bring me trash,” he said to the sergeant. “Perhaps.” The clerk frowned at Heck. “Saltworker,” he said. “Brand him,” said the clerk, tossing a marker to the underling. The man beckoned his helpers for the acid bucket and the brush. He fitted the metal marker on Heck’s forehead while a Whip held him still, and swiped the brush across the stencil. “Who joins Company joins history. Your time begins,” he intoned, ignoring Heck’s screaming as the acid burned. The gool cannot be seen, not properly, but Xantee, Lo and their friends sense its evil presence. It lurks in the jungle in rock clefts, an enemy from …more The gool cannot be seen, not properly, but Xantee, Lo and their friends sense its evil presence. It lurks in the jungle in rock clefts, an enemy from outside nature. And now, a fragment of Gool holds Hari by the throat, draining the life from him. They can hold it back with the force of their minds, but for how long? Xantee, Lo and Duro set out on a perilous mission to find the Dog King Tarl, Hari’s father, and the ruined city of belong. Can he help them find the source of the gool? Will they find it in time? And do they have the strength to destroy the mother Gool and rid the world of this life-sucking force? 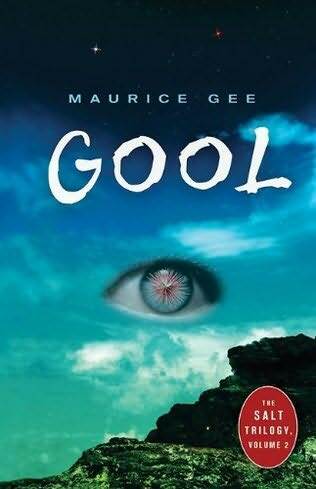 Gool, the thrilling sequel to Salt, is another extraordinary fantasy adventure from the master writer Maurice Gee. You can read an excerpt from Gool online HERE. 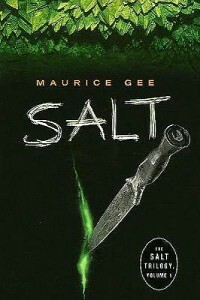 Verdict: Thrilling, thoroughly engrossing and delightfully gritty, Salt is the start of a promising new trilogy from Maurice Gee. Absolutely recommended, especially for fans of the dystopian/post-apocalyptic persuasion. I’ve had my eye on this for a while, so I’m very glad to see you recommending it. I’m a complete sucker for genuinely messed-up protagonists, so I’m sure I’ll enjoy this. I’m glad that I read your review because I would probably not have picked up this book otherwise. I, too, am a sucker for a good dystopian read. Thanks! this book is the stupidest book of all time. don’t waste your time reading it it is extremely boring and has no action or authenticity what so ever.